#02 Did God Create the Devil? Most people in the world are being deceived by an evil genius bent on destroying their lives – a brilliant mastermind called the devil, or Satan. But this dark prince is much more than what you might think… many say he’s just a devious mythical figure, but the Bible says he’s very real, and he’s deceiving families, churches, and even nations to increase sorrow and pain. 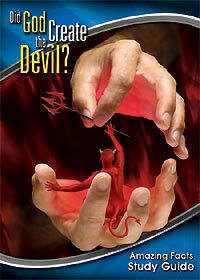 Here are the Bible’s amazing facts about this prince of darkness and how you can overcome him!